Coach Services wanted to find ways to increase efficiency, reduce risk, demonstrate passenger safety and reduce carbon footprint. Since 1947, Coach Services Ltd. has been providing transport for Thetford (UK) and the surrounding areas. They pride themselves in operating one of the youngest fleets of low floor, easy access buses in the area. 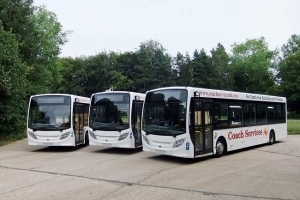 Coach Services runs depots in Thetford and Dereham in Norfolk, UK with a fleet of over 40 buses and coaches providing local services, school trips, private hire and continental travel. At the time fuel prices were skyrocketing as well as premiums due to the nature of passenger transport, what Coach Services wanted to accomplish was to increase efficiency, reduce risk, demonstrate passenger safety and reduce carbon footprint. To begin the software evaluation phase Coach Services sought the assistance of insurance broker Belmont International to help identify the best solutions to better manage driver and fleet risk. After a lengthy search and evaluation, Belmont International recommended GreenRoad to assist across the board with driver safety, risk reduction and cost containment. After rolling out the driver safety program across the company Coach Services found that the initial driver resistance to the technology quickly turned to enthusiasm. “Our drivers’ initial reaction was that they already know how to drive well. They were skeptical that there was room for improvement. But GreenRoad has challenged them to drive differently (and safer) by understanding their vehicle and the huge impact resulting from small movements,” said Robert Crawford, Transport Manager at Coach Services. “Our team of drivers has risen to the challenge and changed their driving for the better. In particular they are now better at planning ahead and anticipating events such as slowing down sooner for roundabouts and corners.“ Both Belmont and Coach Services were thrilled with the results achieved during an initial 30-day blind profiling period. Coach Services recorded a safety score of 60 excessive maneuvers for every 10 hours of driving. Once GreenRoad driver feedback was switched on, this figure dropped to an average of 20 – a 67 percent reduction. In addition to improved driving standards, fuel efficiency has soared by 11 percent, representing an enormous saving and surpassing Coach Services’ expectations about the return on investment. Furthermore, Belmont now has access to detailed Coach Services driving information, making it far easier to predict fleet risk and offer specific risk management interventions. This greatly helps Belmont and Coach Services negotiate better insurance premiums and terms with insurers.